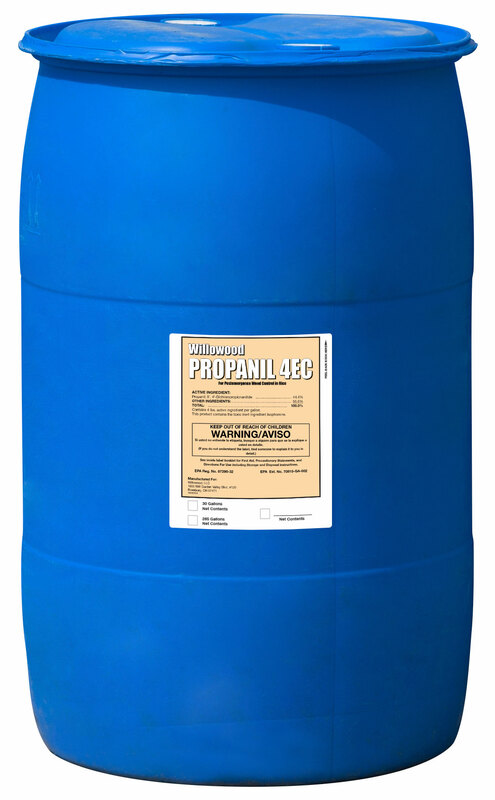 Willowood Propanil 4EC for post-emergence weed control in rice is formulated as a suspension concentrate containing 4 lb active ingredient per gallon. Willowood Propanil 4EC is not a hormone-type herbicide, but kills susceptible weeds by direct contact action. For this reason, thorough coverage of emerged weeds is essential for best results. Willowood Propanil 4EC has no pre-emergence or residual herbicidal activity. Only weeds that have emerged and are exposed at time of application will be controlled. Apply Willowood Propanil 4EC only to fields that have been drained of floodwater. Willowood Propanil 4EC is most effective if applied when susceptible grasses and broadleaf weeds are small and growing actively under favorable soil moisture and weather conditions. Early weed control removes weed competition from the rice crop, saves moisture, and generally contributes to increased yields. Contains 4 lbs active ingredient per gallon. This product contains the toxic inert ingredient isophorone. SUPERWHAM® is a registered trademark of RiceCo, LLC.